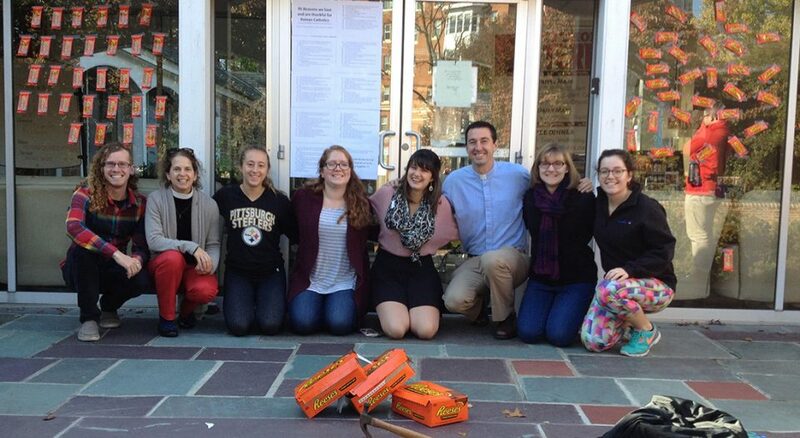 Injecting a little humor into a Reformation commemoration, the students and staff of the University of Maryland Lutheran Campus Ministry – along with two other Protestant campus chaplaincies – spearheaded an anniversary message to their Roman Catholic friends using Reese’s Peanut Butter Cups. In the style of Martin Luther’s 95 theses hung at Castle Church in Wittenberg, Germany, the group posted “95 Reasons We Love and are Thankful for Roman Catholics” to the front doors of the Roman Catholic Student Center. Included in their reasons were “For providing the only education, health care, and social services accessible to many people across the world” (#18); “You don’t sell indulgences anymore ;-)”(#92). You can read the complete list here. No harm was done in this Reformation observance, since the Roman Catholics wrote and framed 9.5 reasons they love the Lutherans. This Reformation activity is just one example of the many things the campus ministries do together, said the Rev. Ray Ranker, chaplain of Lutheran Campus Ministry at the university. Among other collegial and ecumenical events is a Good Friday stations of the cross observance.